Bones can provide mental stimulation, prevent boredom, and satisfy your pup’s innate urge to chew. But not all bones may be safe for your four-legged pal. Cooked, smoked, and dehydrated bones are brittle and may splinter, which could cause an internal injury to your pet, the FDA warns. Cooked bones can also cause dental issues, including cracked or fractured teeth. Raw bones, on the other hand, can be a healthy and safe part of your dog’s diet. Beyond scraping away plaque and removing trapped food particles from the teeth, raw bones can provide a calcium phosphate boost to your pooch. Recreational chewing can also give your dog’s jaw muscles a workout. But while they may be less dangerous than cooked bones, raw bones still come with a few risks. To make sure your pet stays safe while enjoying their treat, pet owners should be sure to follow certain guidelines. 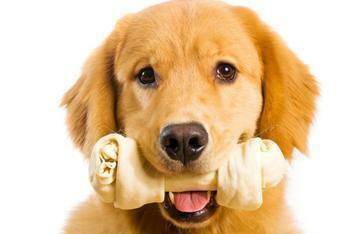 There are two types of raw bones you can give your pet: edible and recreational. Edible bones are hollow, non-weight-bearing bones of birds which provide calcium, phosphorus, and trace minerals. Recreational bones are marrow-filled beef, bison femur, or hip bones which should only be gnawed on -- not chewed or swallowed. This type of bone isn’t especially nutrient dense, but does provide mental stimulation and oral health benefits. Supervise your pet. Make sure they don’t “bite off more than they can chew,” so to speak, by checking on your pet periodically as he or she is chewing. Watch to ensure that they don't choke or swallow it, and remove the bone if it gets small enough to swallow. Separate animals. Even the closest of canine pals can become territorial over bones. If you have more than one dog, separate them before offering a bone. Choose a size-appropriate bone. Because bones that are too small can be choking hazards, make sure to choose a bone that matches your dog’s size. Bones should be larger than the length of the muzzle, so as to be impossible to swallow whole. Choose the right time. Give your pet a bone only after they have had a full meal so they’re not hungry and tempted to swallow it. Be mindful of dental issues. Don’t offer a bone to a dog that has had dental work or crowns. Consider a softer alternative. For older dogs or dogs that have had dental work, consider bringing home a dental dog bone that is softer and easier to chew.